A most moving tribute to a humble and yet hugely influential musician from so many of his friends that some had to be turned away. George's wife Olivia had veto power over the participants but it was down to Eric Clapton to deliver the painful rebuff which he would always preface with an embarrassed, "With the greatest possible respect ...". 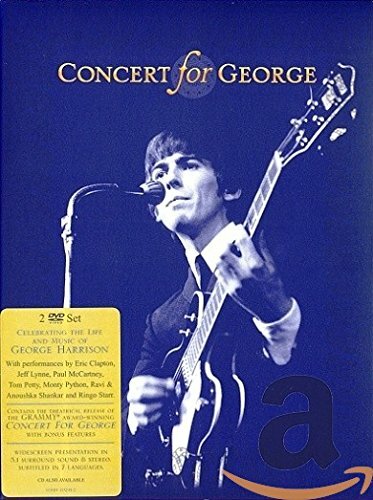 The concert, which took place on the first anniversary of the ex-Beatle's death, unites on stage a vast group of some of the most talented musicians alive, all of them good mates of George's. That he was able to cultivate meaningful relationships with so many diverse musos really tells a lot about Harrison as a human being. This whole package has the stamp of quality about it. An event meticulously planned (3 weeks of rehearsals), orchestrated and pulled off with the single-minded determination of love, that turned into a night the spectators in the Royal Albert Hall will never forget. Fortunately for the rest of us, it was captured on film and packaged as a two-disc DVD. Disc One consists of three parts: the first is a 35-minute performance of Indian music courtesy of Harrison's great friend and mentor Ravi Shankar. Ravi's daughter Anoushka, a sitar virtuoso, opens this mesmerizing portion, accompanied at first by a single tabla (an Indian percussion instrument). For her second piece (a song written by George Harrison), Jeff Lynne sings and plays guitar and more instruments join in, both Indian and non, and Dhani on piano. Anoushka then directs the other Indian musicians in a number called "Arpan" (which means "offering") composed for the occasion by Ravi Shankar to honour George and his life. Ravi's wife (a former singer) contributes a vocal solo, and Eric Clapton plays acoustic guitar at the end. It was a beautiful and moving tribute by people who clearly felt deep emotions but chose to express them in music. I was surprised to find that I enjoyed the Indian segment immensely and often play it as background music when I don't have time to watch the video. I think it proves the truism that when something is done extremely well, anyone can appreciate it. The second part is basically a comic tribute from the Monty Python troupe and friends dressed as Canadian Mounties. To appreciate the significance of this segment, it helps to know that Harrison was a huge Python fan and financed the production of "Life of Brian" when the original producer dropped out at the last moment. This light-hearted and irreverent segment reminded us of George's exuberant sense of humour and served to lift the mood, when it would have been all too easy to sink into maudlin sentimentality. The third part, billed as "George's Band" gets the most play in my house. Here the chosen musicians take turns in performing a selection from the surprisingly vast catalogue of music written by the ex-Beatle, always staying true to his original arrangement. As Eric Clapton explains, on the night every single one of them gave their best ever performance and the emotion is palpable. The full list of musicians and the songs performed is readily available, so I won't repeat that information. It's also pointless to mention my personal favourites, just about every song would qualify, but for sheer musicianship, I have to single out Gary Brooker's version of "Old Brown Shoe", a particularly difficult song which Gary sang and played with great gusto to Clapton's evident satisfaction. "Beware of Darkness" really got to me, "Isn't It A Pity", "Something" and the finale "I'll See You in My Dreams" performed by Joe Brown with a tiny ukulele come to mind, and if you have a dry eye as the rose petals fall, well ... what can one say? But the beauty of this concert is that it was fantastic from start to finish. The bit when Ringo and then Paul come on stage to do their songs is particularly moving, but for the rest it is a joyful, uplifting performance. Disc Two contains the theatre release of the concert, which is not as good as the full concert. Some of the songs, out of order and interrupted by random bits of interviews. The Extras section, on the other hand, is excellent: three features, mirroring the three parts of the concert, and a fourth one devoted to Interviews. Finally there is a Photo Gallery, which is a slide show of stills of the concert. The audio options are: DTS, Dolby Digital 5.1 surround sound and Dolby Digital stereo and, in my opinion, the sound mix is superb, courtesy of the legendary Jeff Lynne who surpasses himself here as audio producer. The entire concert is subtitled in seven languages. Visually, it is a feast for the eye, filmed with great skill by fourteen camera-people and providing good coverage of all the musicians on stage. During some of the later numbers like "While My Guitar Gently Weeps", there are some terrific sideways shots showing 3 or even 4 drummers playing in perfect synchrony. Pure class.